"A beautiful female vampire awakens after a hundred years of slumber to find herself in modern-day Mexico City, in this tongue-in-cheek thriller from director Daniel Taplitz." Not to be confused with the zombie-comedy "Night Life" (with a two word title) from the same year, "Nightlife" is a made-for-TV vampire-comedy starring Maryam d'Abo, Ben Cross, and Keith Szarabajka. As far as I know, "Nightlife" is not available on DVD, and although you will find it to watch online in all the usual places, the VHS version has become ridiculously expensive. 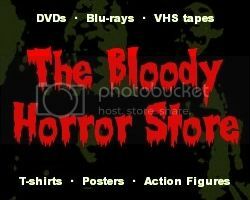 For a low-budget TV movie which is only slightly above average, the price has obviously been driven up by VHS collectors rather than vampire movie fans. Having said that, there's still a lot to like about "Nightlife". Dealing with the most obvious thing first, "Nightlife" has Maryam d'Abo in it only two years after her breakthrough role as a Bond-girl in "The Living Daylights". Although I don't have a "thing" for her, many people do, and she's certainly very attractive as the vampire Angelique. "She's in better condition than my wife!" The coincidence that there's also an Angelique (played by Lysette Anthony) in "Dark Shadows", and Ben Cross went on to play another vampire, namely Barnabas Collins, in the same 1991 TV series, won't be wasted on collectors of such trivia or vampire aficionados. As Vlad (no originality there! ), Ben Cross delivers an often menacing and scenery-chewing performance, which clearly got him noticed and typecast as another vampire later. Because "Nightlife" is a romantic-comedy at its core, Keith Szarabajka, who I've occasionally confused with a young Nick Nolte or even John Heard, plays Dr. David Zuckerman in a traditional yet occasionally comedic manner as he falls in love with his vampire patient. While not the most charismatic or heroic actor in the world (although he was great in "The Equalizer" TV series), he suits the part, and his chemistry with Maryam d'Abo mostly works. Blurry VHS makes everyone look younger. Having mentioned John Heard, "Nightlife" has a noticeable similarity to "Cat People" (1982), especially the relationship between Oliver Yates (John Heard) and Irena Gallier (Nastassja Kinski). Just replace Paul Gallier (Malcolm McDowell) with Ben Cross, and the "eternal triangle" is complete. I'm not saying that anyone copied anyone else here. The sexual rivalry is simply a standard element of most "rom-coms". As a PG-13 rated vampire movie, "Nightlife" doesn't have a lot of blood, and its comedy is subdued enough to cause the drama to be slightly more serious than it should be. Glenn Shadix from "Beetlejuice" (1988) turns up as an unnamed vampire, Camille Saviola gives an over-the-top performance as Angelique's maid Rosa Mercedes, and there are a couple of witty lines, but there's nothing which will make anyone laugh out loud. I think the lack of comedy works in this movie's favour, however, and makes it a lot more palatable for those of us who don't like horror-comedies. There's not much else to say about "Nightlife" other than it was filmed on location in Mexico City. It doesn't have many sets (and the few it does have are a bit sparse), some of the camerawork is dodgy, and the "I Put a Spell on You" song by Jay Hawkins is overused. Apart from those minor quibbles, it's fine. With my rose-tinted glasses of nostalgia firmly in place, I'm going to rate "Nightlife' slightly higher than most people would. "Nightlife" was one of the first vampire movies which I reviewed for a magazine many years ago, and I've enjoyed it watching it again.